Oh what an uninspiring title for a blog post eh! Well, these are my most recent two nail varnishes from the pound shop you see and I’m sure you’re sick of purchases for £1 now so I thought I’d draw you in with that one. 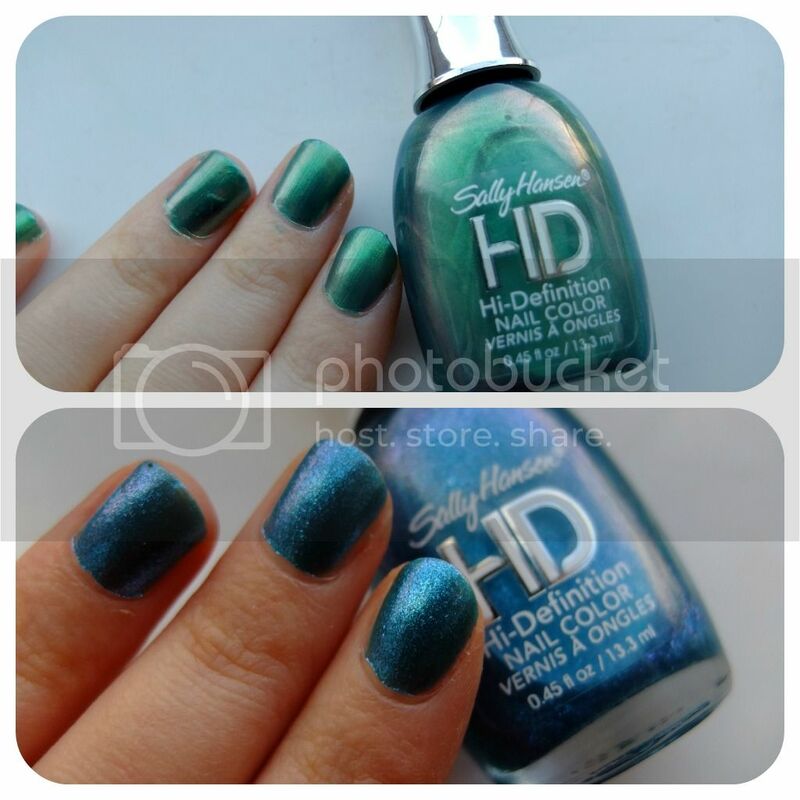 I’m not lying though, this blog post is about Sally Hansen HD Nail Colour’s. Two of them in fact. And they cost £1 each. You can’t say fairer than that! It seems Poundland have upped their game with nail varnish of late and have so many of these Sally Hansen ones gracing the shelves it’s hard not to find a colour you like. You may remember in my last blog post about them I picked up two lovely pastel shades. I also went back and got another green one in the same range, which turned out a lot more opaque actually, maybe I should of blogged about that too. Anyway. Yes, I snapped these two lovelies up immediately. I don’t even like the colour blue but this one was so sparkly and lovely I had to have it. Its really fine glitter and has a kind of pink tinge to it when the light hits it in the right places. The green colour reminds me of frogs and frogs are my favourite. This one would have been so nice if it contained the fine glitter like the blue one but alas it’s more a sheer colour. I also just noticed that on the Sally Hansen website, these two colours (Spectrum and Resolution) are both still being stocked, usually the pound shop only sells really old lines! The green one is such a Christmas-y colour and will definitely be gracing my nails over the festive period, I do hope I don’t smudge it as much then though. It’s quite a lengthy drying time for this one but it is quite opaque in 2 coats. The lovely blue I found looked it’s best after 4(!!!) coats and the picture doesn’t really capture it’s beauty. It has a nice pinkish hue when the light hits it. But as you can see by the first image, after 4 coats the bottle already has a distinct portion of liquid missing! It seems with all the Sally Hansen nail varnishes I’ve tried there are good points and down sides. Although for £1 I can live with the negatives. If you do find any in your local pound land, do snap them up! Especially if you come across the shade ‘Green Tea’….It’s the best one yet, so why I haven’t written about it I don’t know? Apart from the blog post would have nothing more to say apart from IT’S AMAZING FOR A POUND. Next Post Budget Hair Oil? Oh Go On Then….